Because there are other elements at play in a horse’s well being, I also look at exercise, habits, where she lives, how does she eat and how often, supplements, shoes or barefoot, companions, teeth floating, saddle fit and many other pertinent factors. Horse owners are usually very involved in their horse’s healing. Healing doesn’t involve one thing: I’m called in to do a bodywork session, we sometimes need to make adjustments in space, saddle fit, feed, feet, etc. It could be a combination of things, not just a need for bodywork. The bodywork usually reveals any need for additional support, and the best owners are those who are willing to explore alternatives. In the fall of 2010, a 12-year-old gelding named The Kid was intermittently lame in the right foreleg. He also bucked at the canter when asked to pick up the right lead. Upon assessment, I noted that he had some atrophy in the gluteal muscles. His neck, poll and shoulder were also out of alignment, which put a torque in the rest of the spine. There was a bi-directional pattern going on with the left hind limb (where the atrophy was next to the sacroiliac joint) and the right foreleg. He was fussy and had some obvious pain patterns. He responded well to treatments and the lameness and atrophy were resolved pretty quickly, but we felt that we needed to look at saddle fit. He would stop the bucking for awhile after a treatment but there was still something going on. 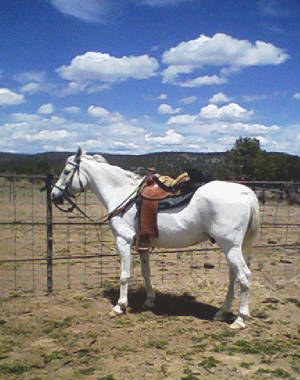 This took some experimentation with different saddles and pads and finally getting one of his saddles refitted. We assessed him at liberty, under saddle and with a rider. During this time his owner was also receiving Ortho treatments and seeing improvements in posture and overall well being. She reported feeling better in the saddle. 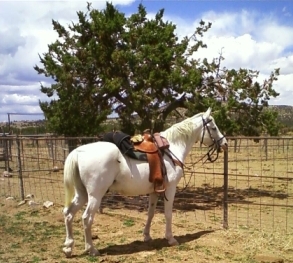 Ortho treatments began to hold longer and he and his owner began to go on some trail rides on the weekends. He was traveling well. We began to notice he was a little underweight so he got some additional groceries and actually a Natural Feeder, which ensured that he have the proper natural position for eating and a steady supply of hay all day long. Four months later, this guy was bombing down the trail. He has very strong feet and can travel barefoot over just about anything. All those problems fell away and right now he doesn’t need bodywork, just mileage. Now you could say, well, you could save yourself a lot of money by just getting the saddle refitted first – except remember, the horse was lame on and off so he wasn’t a reliable mount. Something deeper was going on. Once that shifted with the bodywork, we could see the other problems more clearly and address them as they presented themselves. I liken it to peeling an onion, though hopefully without the tears. You peel back layer by layer, exposing what’s underneath. In a case like this, getting to the deeper matter gives the horse a better chance of speedy recovery and it’s not so likely that the condition will reoccur. The horse’s nervous system reorganizes so that it takes better care of itself – real self-correction at work. The exercise of riding then reinforces that self-correction.